The Apps category of the Settings app includes a new section for Video playback. If you own an HDR monitor, streaming videos using these controls would give an additional feeling. Moreover, this page also provides certain battery settings that let you optimize video for either battery usage or video quality. Some apps use the video platform that's built into Windows 10. These include Universal Windows Platform (UWP) apps that come with Windows 10, such as Microsoft Edge, Photos, and Movies & TV, as well as many third-party video apps you get from Windows Store (for example, Hulu, Netflix, and Vudu). 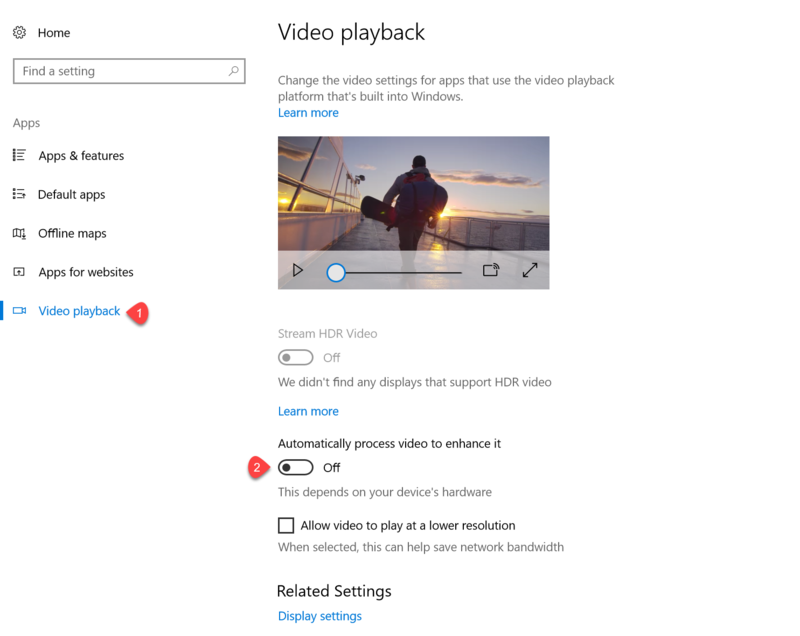 For these apps, you can control video playback using the video playback settings in Windows 10. Your PC should be running build 16215 or higher. After enabling this feature, whenever you play videos their quality upgrades to another level. Moreover, this option completely depends on your PC’s hardware and you get the best experience if you have an HDR monitor. Hence, let us head towards the steps and see from where you can access this option. 2. Out of various categories, locate and click Apps. 3. Select Video playback on the left column of the Apps page. Now, move to the right pane of Video playback and locate the option Automatically process video to enhance it and toggle it to ON. 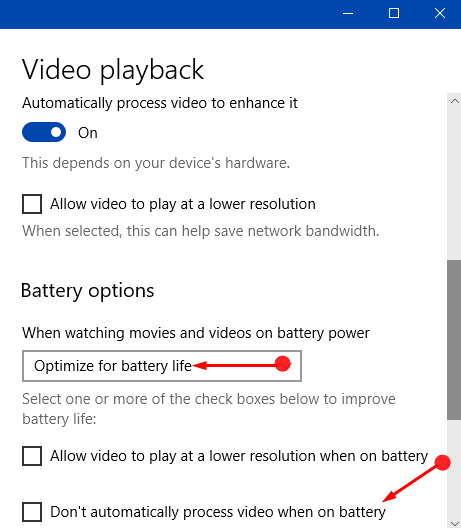 After turning it ON, a new setting namely Don’t automatically process video when on battery get added below Battery options. However, this option is only visible if you select Optimize for battery life (see screenshot). That’s it and now onwards whenever you play videos from built-in platforms on Windows 10, their quality will be improved.